Litigation is the process of taking a case to court. The litigation process is usually connected to civil lawsuits—where one party sues another—but in the general sense, the same litigation process works in criminal cases, in which laws are broken. This article focuses on civil litigation from the point of view of yourself as the business owner or individual who has decided to take someone to court or who has been taken to court. The two parties are the plaintiff, who files the lawsuit, and the defendant, the person the lawsuit is against. Both sides typically have attorneys. Litigation attorneys (trial lawyers) specialize in this kind of work; you can find a trial lawyer in any medium- to the large-sized legal firm. Some individuals and small businesses may decide to go into a lawsuit without an attorney. This is called "pro se" (literally, by self), and you should consider carefully if you want to present your own case. The process of bringing a lawsuit to court begins with the plaintiff filing a complaint, and usually, a summons is also filed, giving the defendant notice of the lawsuit and setting a deadline for a response. Usually, a date is set for the beginning of the lawsuit, and the parties begin gathering information and, taking depositions (statements), and records. This is called the discovery process. Motions are filed with the court by both parties, some requesting information and some procedural. 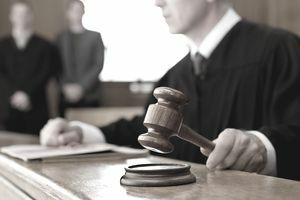 Procedural motions might include a request for a change of venue (the place of the trial) or a request that the case is heard by a judge or jury. The process working up to an actual court date can take several months, as information is gathered and motions are presented and decisions are made. Finally, the lawsuit comes to court at an appointed date. A judge or jury hears the case and renders a decision. If either party has a good reason for questioning the verdict, they can appeal. The appeals process goes up through higher courts. In most cases, the plaintiff has the responsibility to prove that the case is valid, as he or she is the one who starts the process. The court that hears a lawsuit depends on two factors: type of lawsuit and venue where the violation occurred. Some types of lawsuits are heard by a special court. Examples of these would be small claims court, bankruptcy court, or tax court. Other types of lawsuits are heard by the jurisdiction where the violation or complaint began. This usually has to do with where the defendant lives. It can mean that a plaintiff who lives or has a business in one area may have to file a lawsuit in another. For example, if you have a business in Iowa and are suing another business in Illinois, you will probably have to file and litigate the case in Illinois. The most common alternative to litigation is arbitration. Litigation is the default in most cases, except for instances when there is a mandatory arbitration clause in a contract. While litigation and arbitration are similar processes, they are different in many ways. Litigation is a legal process that goes through the court system with a judge or jury; arbitration is a private process that involves an arbitrator who hears the two sides and makes a decision. The decision in litigation can be appealed, but the decision of an arbitrator cannot.